Navarre Beach is a hidden jewel located on Florida's north Gulf Coast - offering 12 miles of soft, white-sand shoreline on the Gulf of Mexico. Located between the Gulf Islands National Seashore and the Navarre Beach County Park, this quaint beach community offers rare, relaxing solitude and simplicity, but is close enough for the city conveniences of nightlife, art, entertainment and a variety of restaurants . 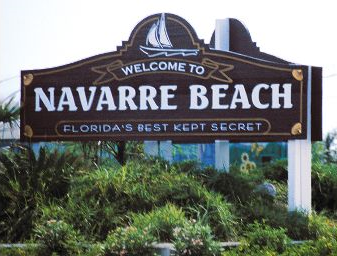 the pristine beaches in Navarre have repeatedly been named among the best in the nation - crossing over the Navarre Bridge to equates to another time and place, when life was much simpler. Visitors soak up the sun at the beach, swim and snorkel in the clear emerald waters, enjoy a picnic in the park or take a bike ride along the scenic bike path. Navarre Beach has numerous accommodation options including VRBO, Condos, Gulf-front houses, etc.- all sure to make your visit as comfortable and pleasant as possible. When you're ready to relax, come to one of Florida's best kept secret, sit-back and experience beach life the way it use to be...the way it should be. Navarre Beach FL Attractions, Reviews, Restaurants, etc.